It’s no secret that I’m an introverted person who is forced into a pretty extroverted world most of the time. This is…. exhausting. My own husband is incredibly extroverted and relies on being around other people to get his energy. I, on the other hand, find complete comfort in 32 quiet minutes reading my new favorite book or even just chilling in front of the latest episode of Togetherness. To say that I like to be alone is a bit of an understatement. I like to believe that I’m a likeable and fun person (people tell me it is true, in fact) and I DO actually enjoy being around and inspired by other people, just in small doses. When I started my own business I went from working in retail (aka: constantly surrounded by people) with an entire company full of new BFFs to all on my own in my cozy home office. It was a real dream for a while. You mean I can just sit here and write and do my thing online and help my clients and never have to interact with another human directly? When exactly is Seamless coming to Columbus so I can become a complete recluse? But over time I found that even us introverts get lonely when left to our own devises. Not only that, but I was learning SO much about myself and running a business that I really wanted to connect with like-minded people to share this experience with. As it turns out, making friends as an adult is challenging. Throw in being an introvert who works from home and challenging doesn’t even begin to describe it. 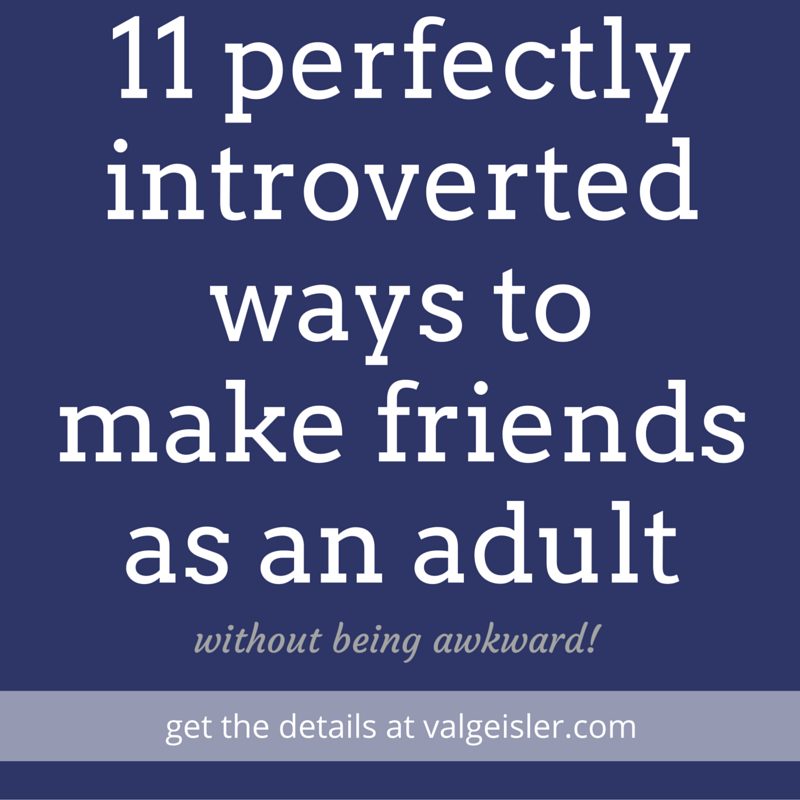 Over the last four years, I’ve found there are a few really good ways to make new friends while maintaining my introverted ways. Of course, a few of these methods have pushed me a bit and made me break out of my shell slightly, but sometimes being an adult isn’t exactly easy. Since we’re no longer in elementary school where you make friends by tagging them at recess (or, in the case of us introverts, by making them a necklace out of daffodils from the baseball field), this guide is designed to help you in your quest to spread your wings and expand your connections. You know your favorite blogs you read all the time? When’s the last time you commented and shared your thoughts on those blogs? I’ve made so many new friends by simply consistently reading their blog (which I was doing anyway) and then commenting on their blog or hitting reply to their emails and sharing my reaction. Think about it: no one wants to write to a blank wall and reading but not commenting is the virtual equivalent of being a blank wall. Consistently sharing how you were impacted by what was written builds a connection over time and you might just find yourself taking that commenting relationship offline and into your real world. You know I love Facebook Groups, right?! Well, finding new friends online is as easy as finding a Facebook Group that resonates with you and taking part in it. Like-minded people = potential friendships galore. Post your own experiences, play along with prompts from the group host, and be sure to participate in comments on other people’s posts. It could be a public group or even a private (paid) group. I have built so many friendships this way – in both public and private groups – and even gone on to do retreats with some of those new friends. The best part? A lot of those Facebook friends are also introverts! Hooray for finding your people! I used to be afraid of Twitter. What with it’s fast movement, limitations on text length, and pushy DMs. But then I learned the real secret to Twitter and fell in love. See, Twitter is a platform that is perfect for listening – something introverts do really well! Building lists of the people you follow keeps you up to date on the most important people to you without wading through the mire of it all. Recently I was at a local startup event with my friend Jay and was asked by someone how I know Jay. When I told him it was from Twitter, I was met with interest and intrigue. Who meets people on Twitter and then becomes friends in real life? Me. And you now too. So you have your Twitter lists setup and you’re listening away… possibly even engaging in some conversations and building relationships. Good for you! Take it one step further and find a Twitter chat you can connect with and start engaging there on a regular basis. The cool thing about Twitter chats is that there are real regulars. Like the neighborhood bar without the crappy lighting, Twitter chats are a way to see the same folks over and over and occasionally some new people show up. The bartender, er, host of the chat posts questions (typically is a Q1, Q2, Q3, etc. format) and you give your answer using A1, A2, A3, etc. so everyone can follow along. Depending on the topic at hand, this can range from “how do you manage your client contracts?” to “what’s your favorite kind of workout?” or anything in between. Pro tip: Participating in Twitter chats on your phone is tough – get on the computer and use something like TweetChat.com to keep it all streamlined and simple. Now hear me out: Skype (or Zoom or Google Hangouts or whatever video conferencing platform you choose) is going to be your new favorite thing. You can stay in your safe and warm home office and have coffee with new friends all over the world. I’ve had Skype dates with people in Manitoba, London, Vietnam, Palo Alto, and even people right here in my own town (perhaps sad, but it’s true). Skype dates are the best way to go from mutually following each other online to actual friends with a little face time. So much can be conveyed in a single face to face conversation that would otherwise take months or even years to cultivate in writing online. So take a shower, put on some lipstick, and setup a Skype date. It’s time to break down that barrier. Last year I met another version of myself: Allie Lehman. This incredible woman re-designed my website (alongside her equally outstanding husband, Adam) and we’ve been fast friends ever since. You know how my friend Claire Pelletreau invited me to co-host the second season her The Get Paid Podcast? Well, Claire hired me last year to help her with her client onboarding and strategizing her launch. While it’s not always feasible to shell out dough every time you want to meet someone new (the definition of paying for friends, I suppose), hiring someone is an opportunity to forge stronger relationships than those that end when the contract expires. After all, you’re likely hiring someone because their message resonates with you. Bring a little bit of your SELF to the conversation and see if anything blossoms from there. Know someone who knows someone you kinda want to meet? Ask for the intro! It takes a lot of guts to ask someone to do you a favor but here’s a little secret: people like helping other people. It makes them feel important and they can check off their “do a good thing today” list. I do this one pretty often (I’d say at least once a month) and it always pays off. I find new friends, new partners for projects, new referrals, and even a renewed fondness of myself. When someone I know and trust introduces me to someone else, they always accompany it with some kind of love and that little bit often helps push me forward in a whole new way. After doing my fair share of online friend making, I was ready to take things up a notch and meet these friends in person. So I found a conference that was relatively small where I knew a handful of other people who were going (and by “knew” I mean knew online…. I only real-life knew two other women who were attending) and I signed myself up. I even roomed with someone who I had only ever had a Skype date with! And you know what happened? It was actually fun! I had such a great time getting to know my online friends better in real life over in-person glasses of wine and hotel lobby chats. It was an incredible way to bond with other women I had been dying to connect with and our friendships and business partnerships have grown ever since then. Not to mention the fact that it led to my highly influential mastermind group last year. Like I said, attending that conference led me to team up with a group of powerful women and form a mastermind last year. Not only did it have a massive impact on my business growth – nothing like a little group accountability to get you into action! – but it also forged some lifelong friendships (see: Claire Pelletreau). Okay so this feels like a little more extroverted, I know, but stay with me here. Meetups don’t have to be massive “mixers” where you don’t know anyone and the drinks are all watered down. Meetups can be small and intimate and leave room for real friendship making. Bonus points to meetups: those new friends also live in your same area so they can become real reasons to leave the house! Getting dressed f’real is a good thing for your esteem and your livelihood, I promise. This is the rogue technique I use for everything from testimonials to forging friendships and it’s super easy. Just think of two people you know who ought to know each other and introduce them. Send an email with something shining about each one of them and why you think they should become instant BFFs. They’ll thank you for the rave review and the connection and they’re likely to want to connect you to someone in return. I introduce people to each other at least once a week. It’s grown my network, my connection to others, and, yep, my bottom line. When I connect others they connect people to me and that is a beautiful thing.